A pool party cake is a tasty way to end a day of fun in the sun. Pool parties are usually held in late spring and summer months, making it perfect for fruit-flavored and filled cakes. Take advantage of the fresh produce selection available at your local farmer's market to make the cake and filling. A cake that is light and airy is perfect for a pool party, as many people do not like having a heavy, full feeling when trying to swim. An angel food cake is another great cake for a pool party. Serve it with whipped cream and strawberries for a refreshing and sweet treat. Of course, not everyone will enjoy a fruit-inspired cake. A birthday cake is often done in more traditional flavors like white, chocolate, or red velvet, especially if it is for a kid's party. Fruit-flavored cakes are often garnished with the fruit itself and a sprinkle of powdered sugar, keeping it light and refreshing in the summer heat. Keeping a chilled container of whipped cream on hand is another effortless topping for any cake. Decorated cakes, especially those made with buttercream, can be hard to keep from melting under the sun. A faux buttercream, made with shortening, can withstand somewhat warmer temperatures. Fondant covered cakes can also be a better option than buttercream. Of course, the best thing to do is keep the cake inside a cool room until it is time to be served, regardless of frosting choice. Children might enjoy decorating their own slice of cake using sprinkles and small tubes of colored icing. Be sure to have a table set up that is far from the actual pool, to keep any food particles from getting into the water. A very moist, heavy chocolate cake can be delicious unfrosted, as well. Cut into bite-sized pieces, it can be a good finger food if you want to avoid the hassle of utensils. Ice cream is a popular topping for cakes and is a good way to cool off in the sun. Keep ice cream frozen until it is time to serve, and set it inside a bucket of ice to help keep firm as long as possible. Having two containers on hand may be a good idea, as you can switch from the first to the second once the first one becomes too messy. Do not serve the cake immediately after everyone has left the pool. Give everyone time to grab a drink or use the restroom. Have people dry off and cool off a bit in a shaded area, then announce it is time for cake. Cut the cake into uniform pieces and serve. The actual set-up may depend on where the pool party is hosted--at your home or at a swimming pool facility. 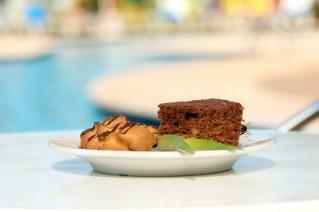 If you are having the pool party at your home, keep the cake inside until it is time to eat. Set up a picnic area away from the pool, with forks, knives, toppings and paper plates. You can use the same area you served the rest of the party food or have another space available. Be sure to have a large garbage can available for waste. Parties held at pool facilities may offer a separate area for food and drinks where you can cover tables and set up. However, there may not be an option for keeping the cake cool indoors, so arrange to have someone deliver it close to dessert time. Be sure children understand that they cannot take the cake out of the designated area. A cake is a yummy dessert for any occasion. Pool party cakes can be refreshing and light or decorated for a special occasion. Regardless of the reason, everyone will enjoy the traditional treat after a day of swimming.